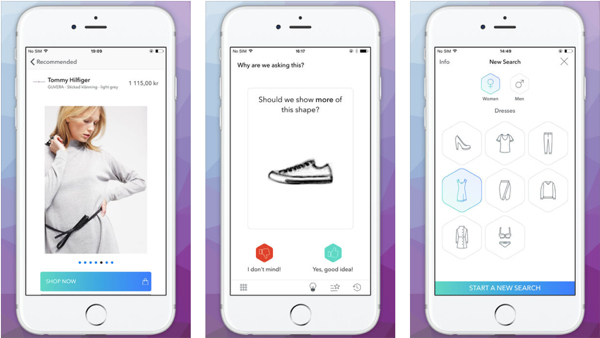 Fashionflow is a new cool app that wants you to find the fashion you truly love. The app is built around speed, ease of usage, and fun – you simply have to swipe right if things are going into the right direction or swipe left if you don’t like what you see. Within a few couple of swipes you will have found awesome fashion products you love. Interface: This interaction mode allows for full screen pictures. Useful for small screens and fashion. It also allows for small sessions. The time you wait in line at the supermarket e.g. Exactly where a lot of mobile usage happens. Discovery: It as a very deliberate discovery mode. Data: Every interaction is an intentional evaluation of what one sees. (o-1: negative or positive) The data generated can be used to better serve the users and create cohorts of users for clustering for other features. (3) means that with every swipe, every user interaction, the data gets richer and Amaze can better understand the user. This is very important. This way Amaze can learn very fast what the preferences of its users are.2 There is a positive feedback loop between (2) and (3). The better the data the more likely a given user likes what they are shown and the more likely they like the app in general and keep using it (and last not least keep buying stuff). And the cycle continues. The app is currently being tested exclusively in Sweden because the country is concidered to be one of the most mobile friendly countries among Zalando’s 15 markets. The company has also noticed that the Swedes are more positive to shop inside apps than many other nationalities. > We are an international company and see differences between countries. The Nordic countries has a high mobile penetration. We don´t want to test everything in Germany and are keen to try new business models in other countries, and Sweden is quite open to this kinds of experiments, said Christoph Lütke Schelhowe. The publisher of Fashionflow is again Zalando’s subsidiary Mobile Fashion Discovery GmbH. Zalando: What is Fleek’s Value Proposition for Users and Brands? Stay informed and never miss another insightful article on the retail of the future! Subscribe now to Early Moves by e-mail and get new articles once every weekday delivered right to your inbox! You can also subscribe to Early Moves by RSS. Amazon Is Not Giving Up on China, Goes on a Hiring Spree. Thx Cross-Border Commerce! We are analyzing the companies that are shaping the retail of the future around the world. Publisher: K5 GmbH, the company who co-launched GLORE, the first global e-commerce only investment fund, and organizes K5 conference, the leading e-commerce conference in Germany. All new articles for free in your inbox once every weekday.